Parazoa (Latin: "beside the animals") is a subkingdom of animals. 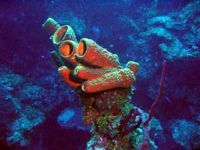 The only parazoans are the sponges, which belong to the phylum Porifera. This page was last modified on 20 April 2010, at 20:23.